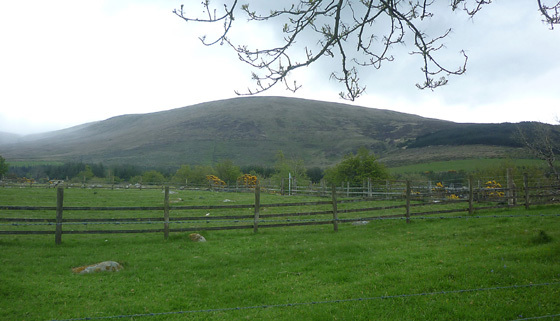 Ballineddan Mountain is a townland. The name is derived from Buaile an Fheadáin meaning 'milking place of the stream'. Ballineddan Mountain is the 193rd highest place in Ireland. A simple stroll to the top with possibilities for greater things. You can reach Ballineddan from the road at Ballinfoyle, where there is a three way junction, parking at around S 986 903 H. There is a prominent gap in the forest there which leads directly onto rough moorland below the mountain. There are other routes as mentioned in this note which was originally on the MCI website: "If you are walking on the northwest slope of Ballineddan Mountain please use the stile and gate provided at the bottom of the slope. 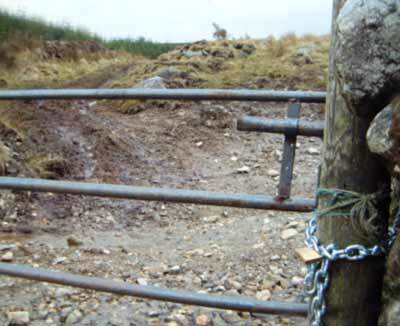 Damage has been done to the fence and if this continues the farmer will deny access. The stile is at GR 994 910 I and the gate at GR 997 914 J." Near Ballinfoyle (S 986903 H) there is a track leading up to Ballineddan. Here you will find this stout gate with chain. On this occasion we welcome the locked gate because it is intended to keep quads and scramblers out who are causing serious environmental damage. This damage is particularly bad near Slievemaan as you can see from earlier comments in Mountain Views. You can even see the start of the damage to the left of the photo. Picture from Harry Goodman : Descending W from Ballineddan Mt. with view across to Keadeen Mt. Picture: Descending W from Ballineddan Mt. with view across to Keadeen Mt. A pleasing end to a misty wind swept day. I climbed this in July 2008 on a beautiful really sunny afternoon. 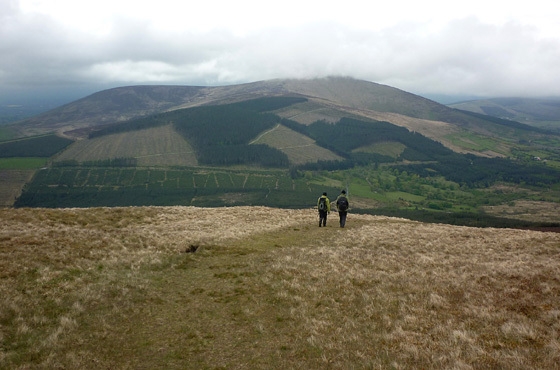 I followed the directions given in Joss Lynams book about easy walks in Dublin/Wicklow. From the road near Ballinabarney gap it took an hour to the top. I parked near the military warning sign which is on the southern base of the mountain. I started through a locked gate and moved up in a firebreak gap in the wood. About 100m up, there is another gate (again locked) At this point you leave the edge of the forest and begin walking ENE up the hill. There is a track which I followed from here to within 100m of the top. Its a vehicle track but has not been used in a while (no evidence of the dreaded quadbikes). Its an easy walk then to the top. There's a small stone cairn at the top and a good view of Lug (to the ENE) with many walkers on it (spotted through the binoculars). Slievemaan is close by - to the East. I can see why this could be an access route up Lug.......maybe for another day.